I've only got a small amount of this Amazing Vintage Fabric...just enoug for a couple throw pillows, perfect for accents in your Mid Cent Mod home or office! Iconic Mid Century Modern Design in Classic Colors of the Era! Pillow cover shown is 11" x 17" stuffed with an 12" X 18" pillow form. THIS LISTING IS FOR ONE PILLOW COVER ONLY -- You may stuff it with your own, purchased pillow form. 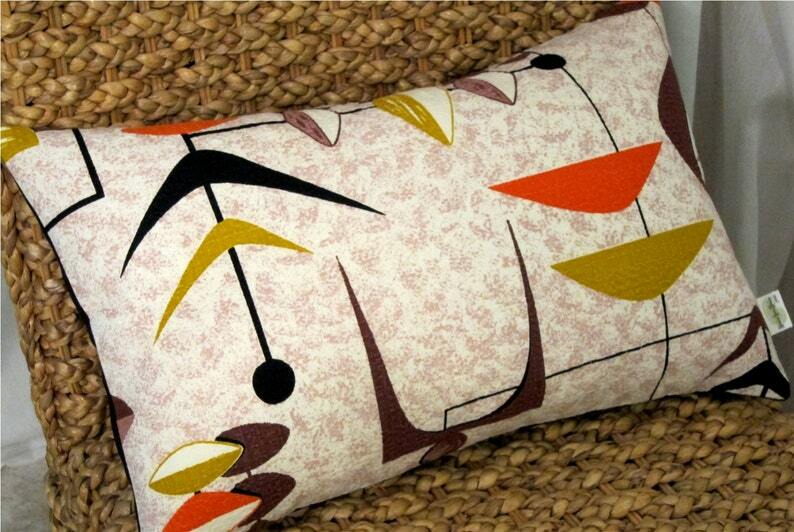 I line all of my vintage fabric pillow covers for additional strength and durability! 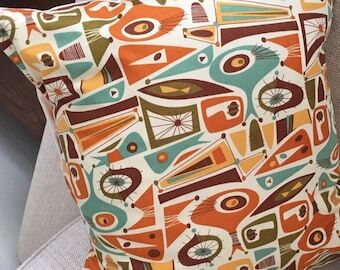 All of my vintage barkcloth fabrics have been hand selected over many years and comprise the best of the best of Mid-Century Modern style! Toss a couple on your sofa or bed to MAKE the LOOK! All My Pillows are Created in My Pet-Free, SMOKE-FREE Home! Gorgeous and Perfect as always!! I'm very happy with the valance. The quality of the material and sewing is topnotch. Thank you, Robin, for making exactly what I wanted for my mid-century yellow and black bathroom. Such a bright fun addition to our neutral couch. Love the texture and the colors! I do accept money orders (contact me), but, much prefer PayPal as it makes it so easy to print shipping labels to accurately ship your items to you! Did you know that you may pay with a CREDIT CARD on PayPal WITHOUT needing to have a PayPal account? It's safe, secure and easy! Just choose PayPal at checkout and following the simple instructions! Returns are possible, but, may take longer than usual to get to me IF we are on the road. I will take the extra time into account when you are making a return. When I'm home, it's not an issue. If you are uncertain about anything, feel free to ask! Please, read my excellent feedback! Please Note: Excess shipping costs, over $1, for combined purchases will be refunded to your payment source after your shipping label is printed. I now use Etsy's Calculated Shipping app, but, for purchases not made at the same time, you will be charged shipping for each individual purchase. No worries. I refund the difference paid between actual shipping cost and what you paid, after I have your package ready to go. Thank you so much for shopping with me! I know you won't be disappointed. Please, don't forget to let me know that you're happy and leave feedback...or I'll fix it! Most items are made to order and they will take from 1-3 weeks, depending on what you order. Custom orders may take a few days longer. If you need something by a certain date, please, contact me and I will do my best to accomodate you! When a package is shipped, you will receive a message letting you know it's on it's way and that will include a tracking number. INTERNATIONAL BUYERS -- Please check with your country as to duty, fees, ect. I am, obviously, not responsible for them. Also, I am not responsible if your mail system loses your package. Please, if you feel the need, request insurance. I am happy to supply a quote and add that option to your shipping.